Caudalie Fleur De Vigne Shower Gel is 100% soap-free, with an ultra-gentle plant-derived base, which respects your skin's pH levels. Its delicate white rose and rose pepper fragrance leaves a delicate scent on your skin. This silky soft shower gel pays homage to the Fleur de Vigne which only comes out for a few special days in June. Caudalie Fleur De Vigne Shower Gel contains pure aloe vera and plant-derived glycerine to transform your shower into a moment of total relaxation. 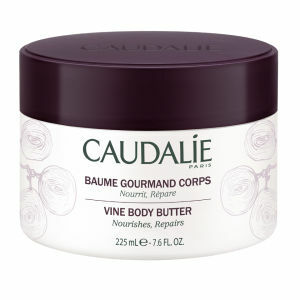 After your shower, moisturise your skin with Caudalie Nourishing Body Lotion. I first received this as a gift. I thrilled by its fresh scent and gentle cleansing. It is perfect for a morning shower. The bathroom smells wonderful after use. I have since bought three more from lookfantastic- 2 of this fresh scent and 1 of the tea rose, too try. I love them both! This shower gel smells good enough to eat. Love it! Great way to start the day. ... Feels amazing too! Great. I love this product!